The chest press is a classic weight lifting move to help build chest strength and size. 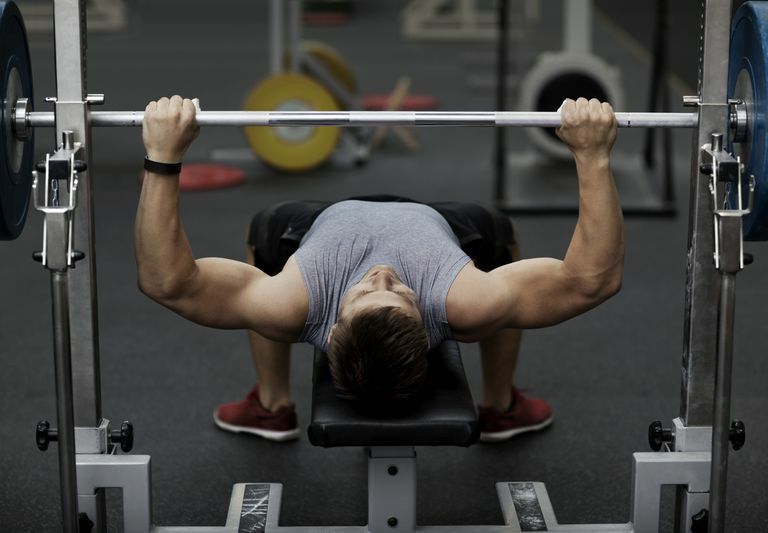 In fact, one of the most common questions lifters ask is “How much do you bench?” You may be surprised to hear that people are lifting their bodyweight or more when the exercise is performed on a flat bench. Although the classic press is beneficial and impressive, other varieties of the press are being used to stimulate the chest muscle differently for even better results. Research shows the decline press to more effectively activate the lower pectoral or chest muscle compared to flat or incline bench. The decline press is underperformed simply for its lack of machismo, but it certainly is an exercise shown to complement a chest routine. A well-balanced chest workout that includes flat, incline, and decline press can greatly improve muscle imbalances and increase strength. Other studies indicate chest press variation as an important component to maximize performance. Varying the angles of your press can help reduce stress on the shoulders, elbows, and wrists. This allows you to increase training volume without compromising work to the chest muscle. You may be new to weight lifting or seasoned lifter wanting to improve a chest routine. There is no need to feel intimidated because the decline press is an exercise that can be modified to every fitness level. Seeking the guidance of a qualified personal trainer may be a good idea in the beginning until you are comfortable with the exercise. The decline press targets the lower pectoralis muscle better than flat or incline press. This makes it a great complement to balance out a chest workout and beneficial to lifters trying to increase overall press and chest development. Decline press also provides a variation shown to fix imbalances from chest routines that lack lower pectoral stimulation. Exposing the muscle to varied exercise angles can help increase muscle activation, stimulate new muscle growth, improve strength, and provide better development and symmetry to the chest muscle. Pressing at a declined angle also reduces stress on your shoulders allowing you to really focus on achieving a good chest pump during the exercise. This position is also shown to reduce low back strain compared to a flat bench chest press. The decline press can be a great alternative for people who find flat or incline press causes too much discomfort in the shoulders and low back. A spotter or smith machine is recommended for safety. Use a decline bench station or decline bench/power rack combination. Position the barbell at the correct reach level on the rack (you are able to grip/lift the bar off rack with assistance). Load weight resistance appropriate to your fitness level on the barbell. Secure your feet at the end of the decline bench and slowly lay down on the bench. Avoid hitting your head on the bar as you lower your body down. Grab the bar using a regular/standard, slightly wider than shoulder-width hand grip. Unrack the weighted bar with spotter assistance. Slowly lower the bar to your chest, inhaling during this part of the motion. Raise the bar with an explosive push to start position, exhaling during this part of the motion. Repeat the exercise for a determined amount of reps. Tighten your core, keep chin tucked, exhale and lift your body up grabbing footholds to get off the bench. The decline press is a great way to add variety to your chest workout, but there are a few things to consider to ensure proper form and technique. The decline press places you in an awkward position to unrack/rack the challenging weight. This increases your risk of injury. Whenever you are performing this exercise, enlist the help of a spotter or use a smith machine to ensure your safety. Bouncing the bar off the chest is an attempt to push very heavy weight up with momentum. This increases the risk of injury to the sternum and decreases the effectiveness of the exercise. The press should be executed slowly and with control from start to finish using appropriate weight resistance. This ensures proper form and activation of the chest muscle. Lifting weights that are too heavy is common among bodybuilders and regular gym goers. Form and technique are sacrificed and risk of injury is increased. Reduce the weight resistance to your fitness level to safely perform the decline press in full range of motion. Breathing properly is an important part of effective weight lifting. Many people hold their breath during the hardest part of the movement causing internal body pressure. Stay in tune with your body and breathing during the exercise. Inhale slowly as you lower the bar to your chest, and exhale during the explosive push up to start position off the decline press. The decline chest press can be performed in a variety of ways to accommodate your fitness level. Please keep in mind that a spotter is always recommended for safety with this exercise. Perform a flat chest press until you are comfortable with the movement and before progressing to a decline body position. Use dumbbells instead of a barbell. This will enable you to perform the exercise with light weight and feel confident before progressing to the barbell. Perform the decline press with the barbell only before adding weights. This will help develop your form and function and allow you to progress comfortably adding resistance to the bar. Perform the press using dumbbells instead of the barbell. This will allow a deeper range of motion during the exercise and increase unilateral development of the lower chest muscle. Increased stability demands cause the muscle to work harder to perform the movement. Start with lighter weight and increase the resistance as you feel comfortable holding dumbbells in this position. Increase the resistance on the barbell as you gain strength and confidence with the decline press. This will increase the work intensity and effectively stimulate the chest muscle. Increase the number of repetitions during a set and challenge the decline press to muscle failure. Perform the press using a wider grip to work the outer lower pecs and a closer grip to increase the challenge on the inner pectoralis. Weight training requires attention to body position, form, and function. Performing any resistance exercise improperly can increase your risk of injury. The following tips will help you perform the decline press safely and effectively. Always use a spotter during this exercise for your safety. Since the weight sits directly overhead during this exercise, a regular grip is recommended on the bar instead of a false grip. (A false grip is where you keep the thumb on the same side as your fingers and the bar rests on the palms.) A regular grip is safer and will reduce the chance of the bar slipping. Perform and master the flat bench press before progressing to a decline body position. Perform the exercise using appropriate weight resistance to ensure proper form. Perform the exercise on a proper decline bench with a secure foot setup.